Today, starts my new week. Kinders are wrapping up their 5 senses with popcorn. I handed out a kernel to each kinder while they entered the room. We reviewed our five senses through our song to Bingo each time we meet...I have five senses yes I do I use them every day-o. Ears, eyes, nose, mouth, hands...you get it...they love it. We belt it out now that we have sung it 5 times. 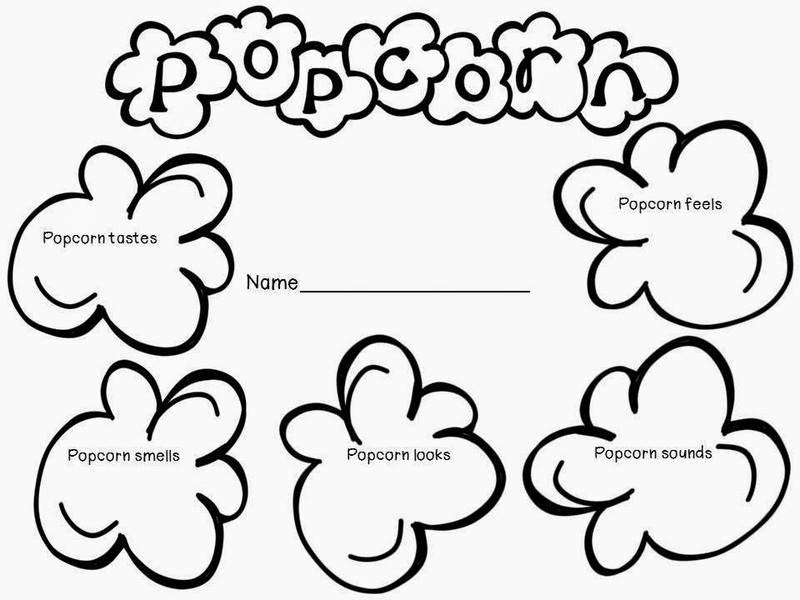 We started by watching the popcorn popper, shared our descriptive word, and made a chart. We then felt one popped corn and then got a whole cup to eat...YUM! We finished up with the writing of our words in the popcorn kernels at our seats. The kernel is hard, pointy, and brown. We watched it pop, wondered where the moisture comes from, and learned why popcorn pops! finished up with this freebie for you! The kinders loved eating popcorn and reviewing the 5 senses! Thanks for poppin' on over!